I've never been more excited for a season, well, ever. Because flowers make everything so much more fun! Being able to live in the city that's famous for this ~wonder of nature~ makes one of the best seasons that much more enjoyable. Unless you have allergies. Leave other suggestions in the comments below, if you wish. Below are two ways that showcase this ~new style~ that truly reveal this strange mood that can only be encapsulated by the above Instagram post. Dress, loafer mules, and sunglasses by Madewell (can you tell I'm a sales associate there?). Bandana used as a bracelet is thrifted. In my first attempt at spring 2017, I took a literal approach and did the florals thing. Groundbreaking, am I right? But I match the flowers right above my head! It seemed more than fitting, considering this is my first spring being surrounded by the thing that attracts so many tourists. 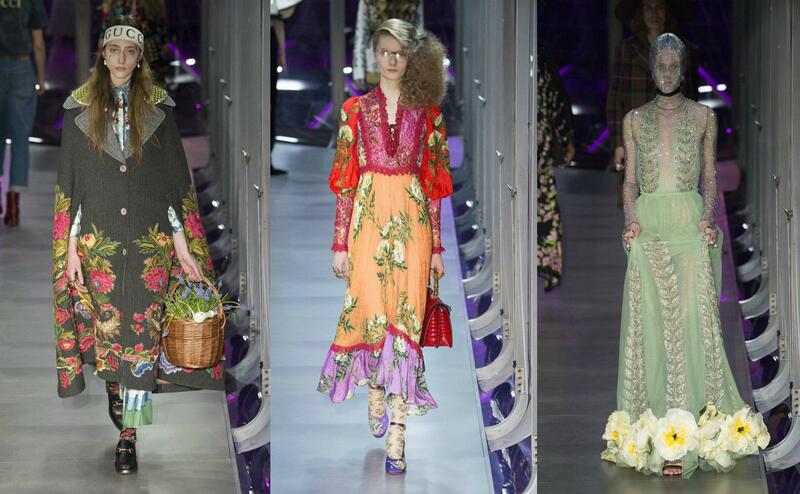 Luckily, this is a fairly simple approach: wear absolutely anything with florals. 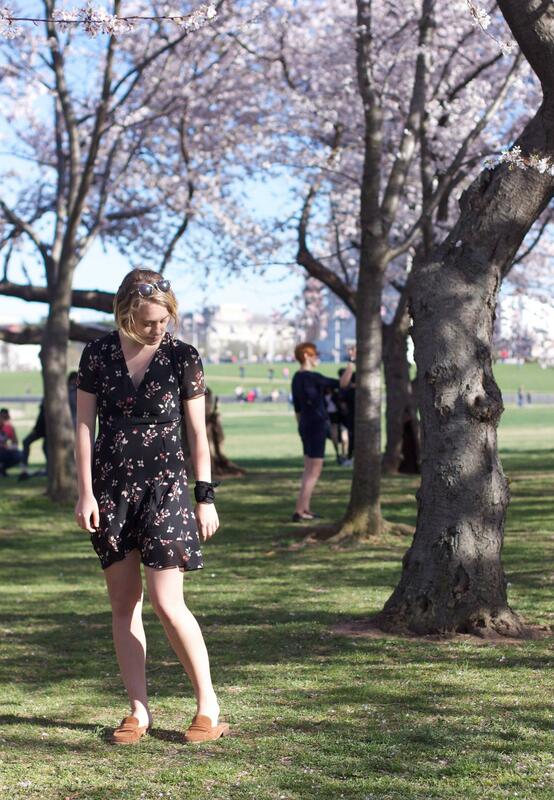 Investment pieces like this Madewell wrap dress that resembles Reformation's warm weather aesthetic work especially well, considering the flowers on it actually do resemble the pale pink cherry blossoms. I decided to tie a vintage neck scarf (which I thrifted in Seattle!) around my wrist because I'm trying to break my neck scarf habit, and this way I can still have my fix without actually covering my lovely collar bones. Kind of like those Nicotine patches? 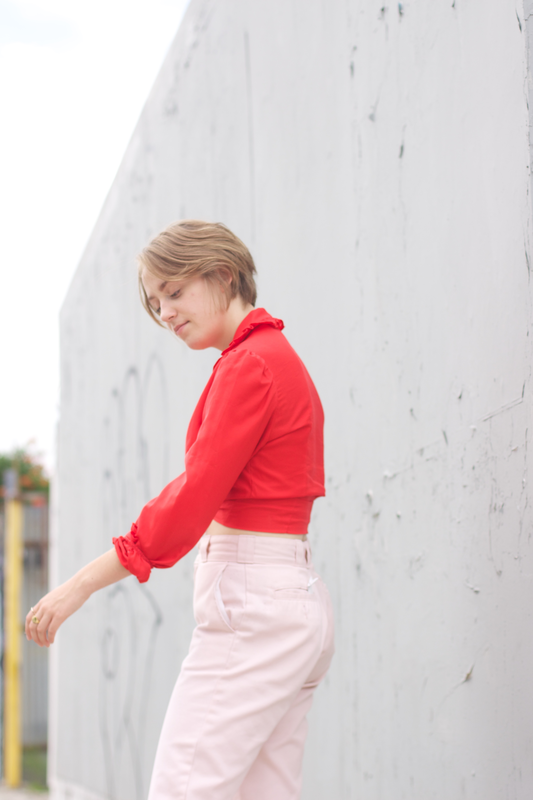 I then slid on my loafer slides, a style of shoe that should become the official shoe of spring because they're just that easy (and not too summer-y like open toed slides), and only three steps later, my first spring lewk was complete. Where's my "That Was Easy" button? Tank and Denim Jacket by Madewell. 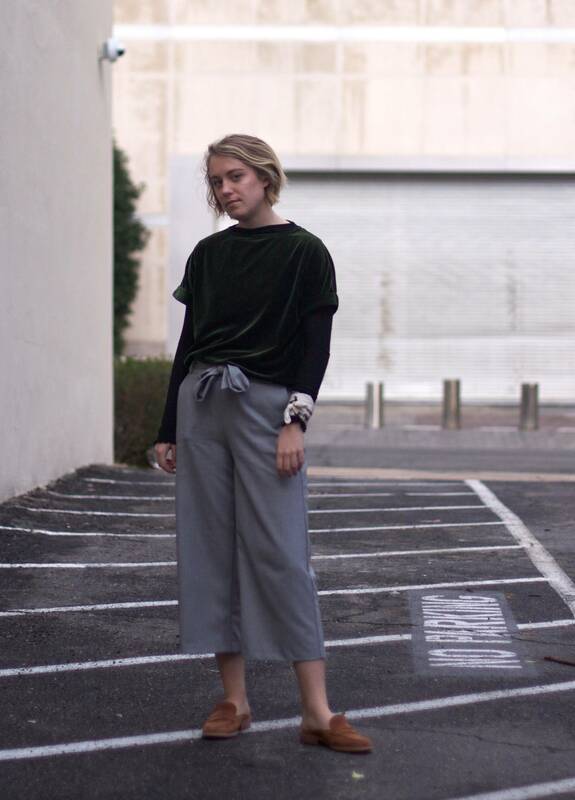 Pants are thrifted (or find some similar ones here). Clogs by Anthropologie. 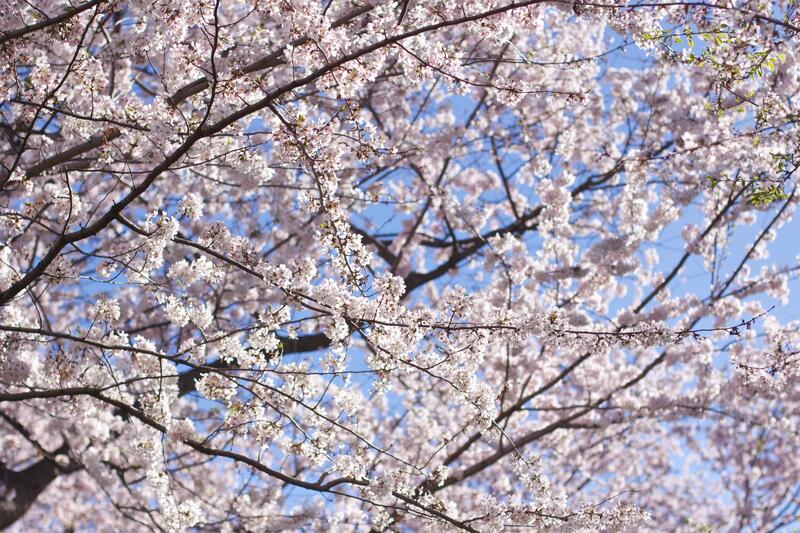 Even though it's technically spring and pants season is long gone, the weather the day after my cherry blossom nap dropped about 20 degrees, so I knew covering my legs would be a necessity. But that doesn't have to mean jeans! 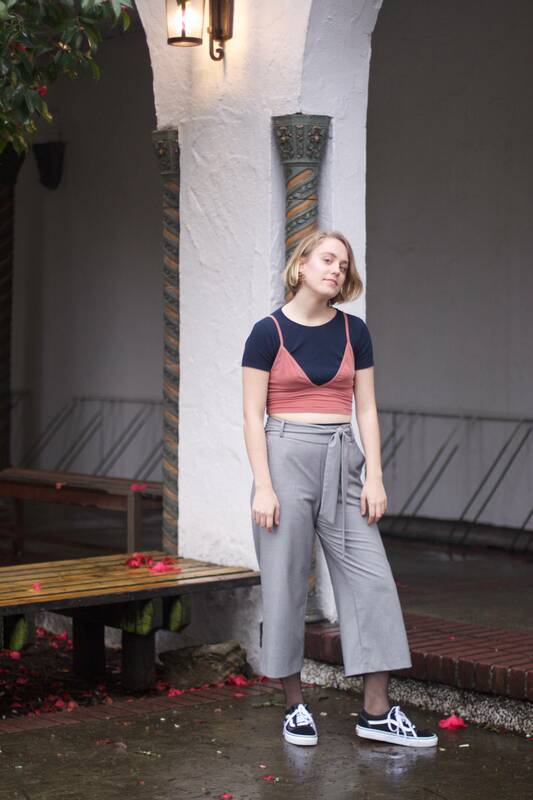 I got these Dana Scully-esque trousers that used to go past my toes before I found a pair of scissors while thrifting in Seattle, and they're perfect for this in limbo transition–they still do the same job of pants, but its thin material and ankle-revealing properties make them a perfect spring pant. So even if it is 70 degrees, these babies are your best bet if you can't seem to hop off the pants train. As I said earlier, this new season has only made me crave more feminine styles, so to emasculate the look, I paired them with a red sweater tank, also similar to my favorite Generation G shade, and my blush clogs, which exactly resemble the tint of those cherry blossoms (and Glossier's Cloud Paint in puff, I suppose?). 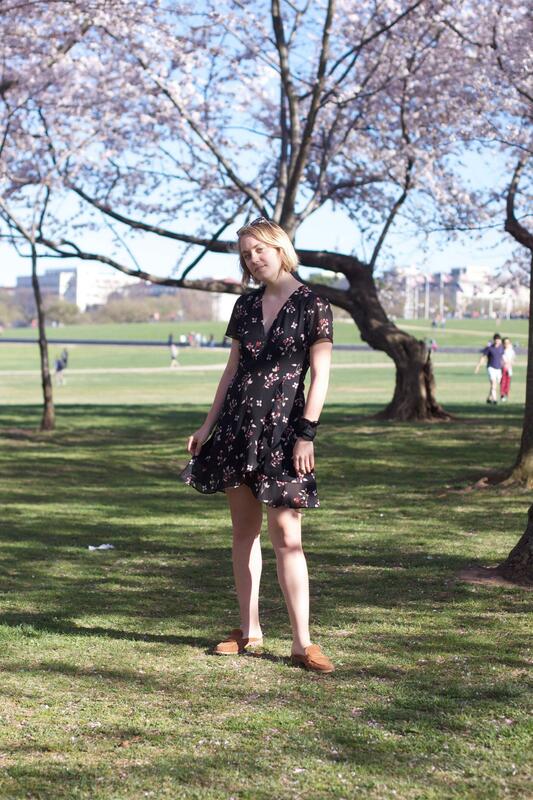 This is a nice way to ~transition~ into spring if you're not really into floral prints or ruffle hemlines because that peep of shoulder and ankle (and arm and chest and foot, for that matter) prove that the sun is about to be out for good. 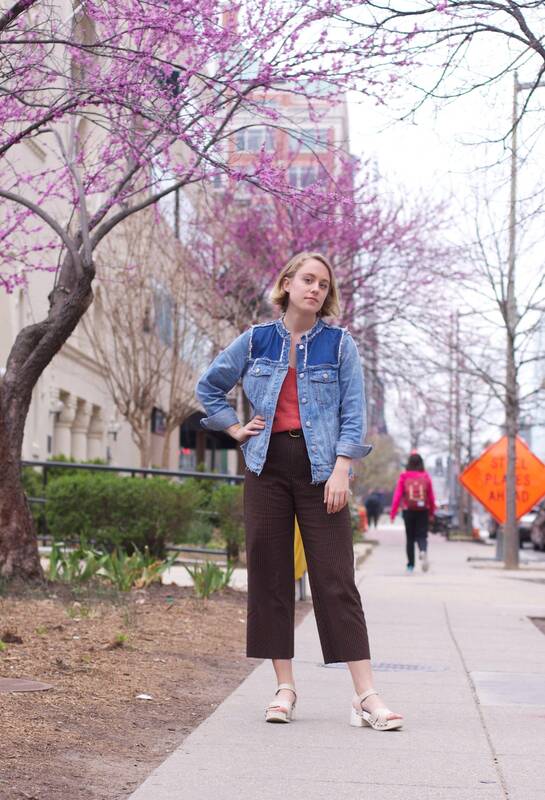 Because denim should be the official layering fabric of spring, I wrapped my arms and shoulders in my new collarless denim jacket (from Madewell, of course) to change things up a bit–collared jackets seem so last season. Minutes after taking these photos, I realized I should have definitely worn socks with these clogs; I guess I got a little too excited for the new season. Are any of you guys amazed that I haven't used a spring pun yet? 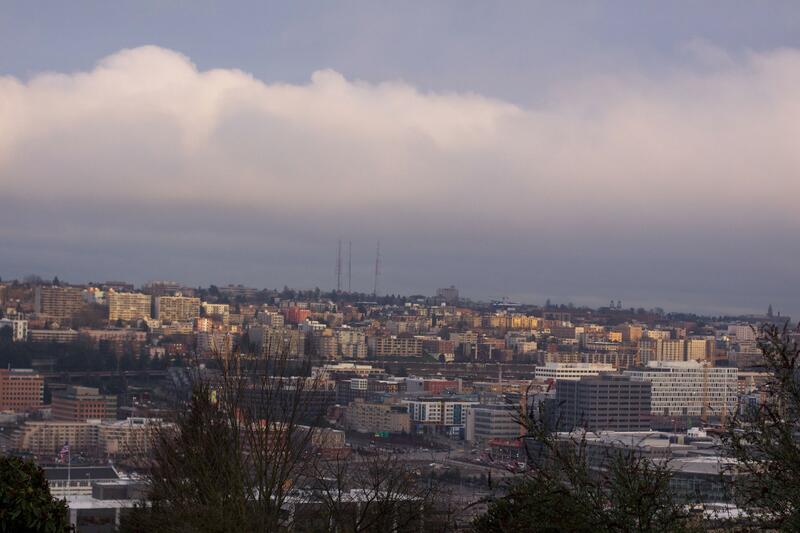 Well, time to end that shock, because spring has officially sprung. Top by Monogram. Jeans and belt by Madewell. Neck scarf by J. Crew. Boots by Topshop. 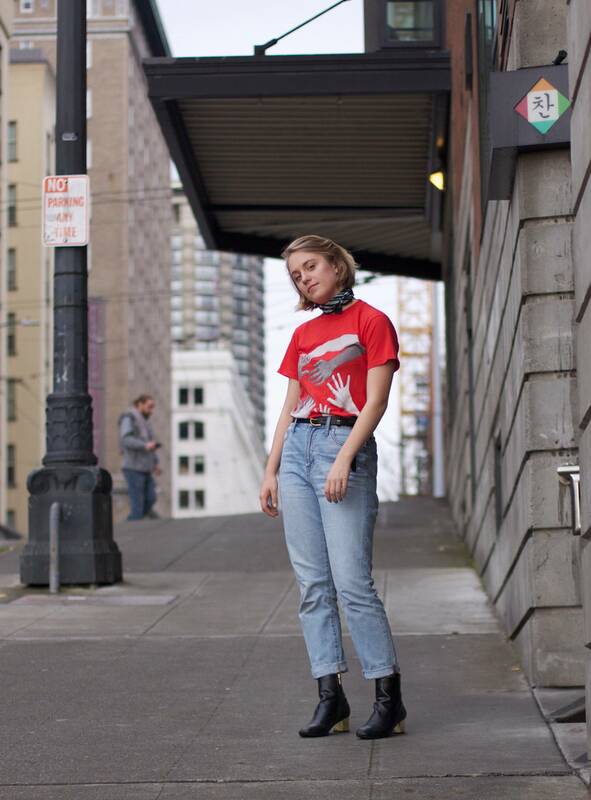 I got a feel for Seattle fashion by walking around local neighborhoods, and planned my outfits both according to what this city dresses like but also according to what I want to dress like (as always). 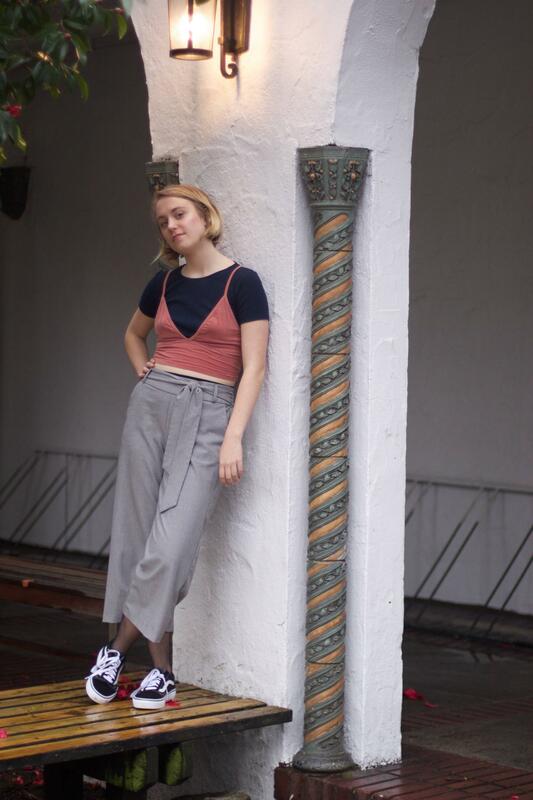 The combination of laid-back, grungy, and quirky style, which usually consists of 90% thrifted materials, told me to pair my newest pair of Madewell perfect summer jeans, or what I like to call "flattering mom jeans," with a graphic tee that's meant to look vintage but is really brand new from this L.A. based company that is 100% sustainable, made in the U.S., and is made of homemade fabrics (this combo seems very Seattle to me). To make this relaxed look my own, I tied a neck scarf around my neck, an art that feels like second nature to me by now, and slipped on my gold heeled ankle boots, ready for day one. 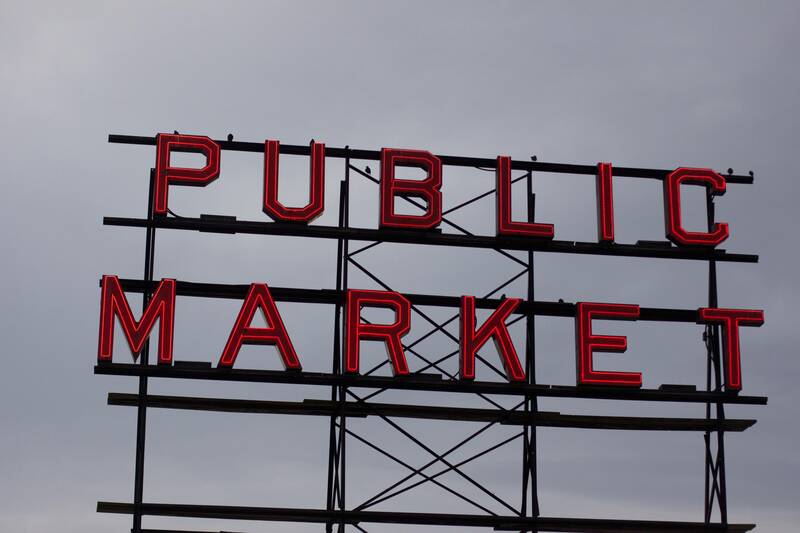 I drove around for almost two hours, just trying to find parking, then finally found a place next to Pike Place Market, ready to be a tourist for the day. Walked around the shops, took an obnoxious amount of photos of my friends, bought a few snacks (I'm already missing that curry beef-stuffed bun). Continued to pass out at 10 pm--time zones are no fun. Entered my first ever Seattle thrift shop, an experience that needed to be documented but unfortunately was not. Bought a vintage pair of Levi's shorts that will be DIYed very soon, along with a bandana, for the price of one meal in D.C. Continued to ask myself why this was my first time purchasing items from a second-hand shop (excluding Goodwill), and swore off of non-thrifted items for the rest of my life, which will probably be broken once I visit the new & Other Stories shop in Georgetown next week. 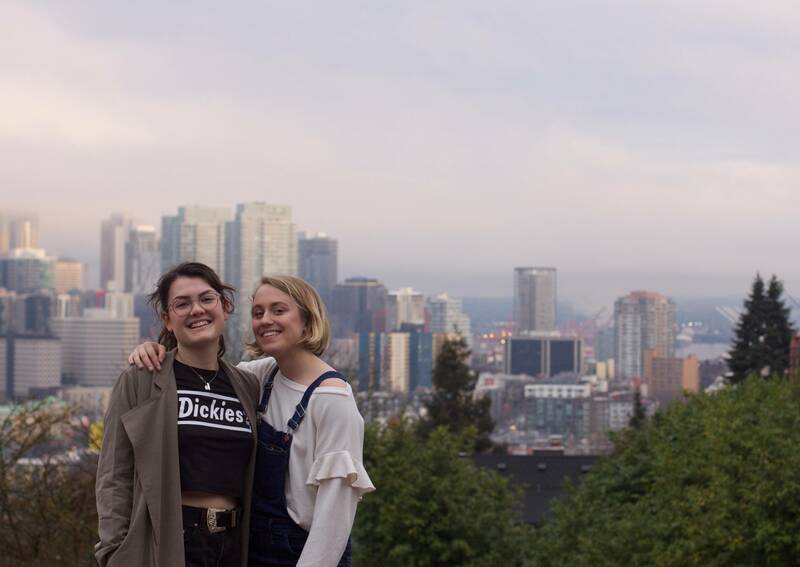 Took obligatory photos of view, of my friends with the view, and of my friends and I with the view (ft. my Madewell overalls and Zara ruffle sweater/pirate top). Orange tank by Urban Outfitters. Navy top by Topshop. Pants by Zara. Fishnets by Asos. Shoes by Vans. 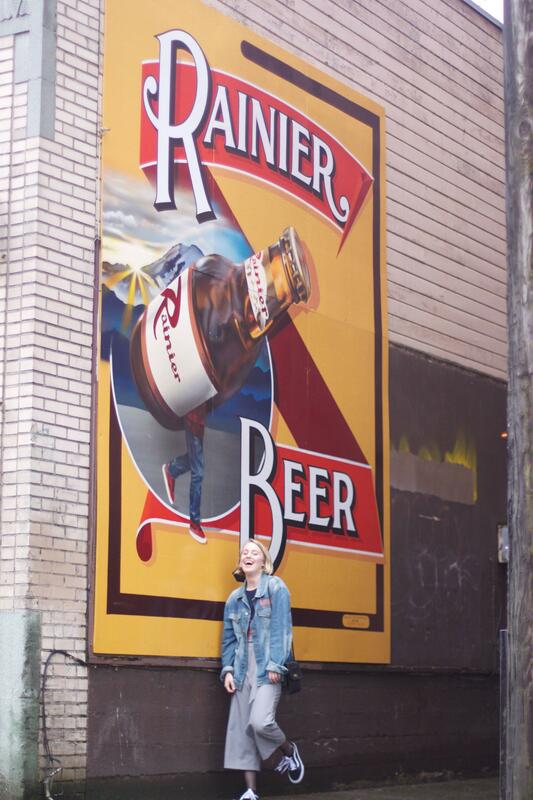 For my other ~officially documented~ Seattle lewk, I opted for the edgy route and paired business-casual cropped trousers with items that are the exact opposite--a cropped orange tank over a navy ribbed crop top, fishnets, and my (newest) pair of Old Skool Vans (also peep my new Glossier cloud paint!). How skater girl of me!! I walked around Capitol Hill in this 'fit (which, by the way, is completely different than the Capitol Hill of D.C.; it's more similar to the Castro of SF), which consisted of more thrifting, attending a hip coffee shop that is actually owned by Starbucks but tries to act like it's not because its customers are too much of coffee snobs to actually buy coffee from an actual Starbucks, and spending too much money on Thai food and records. 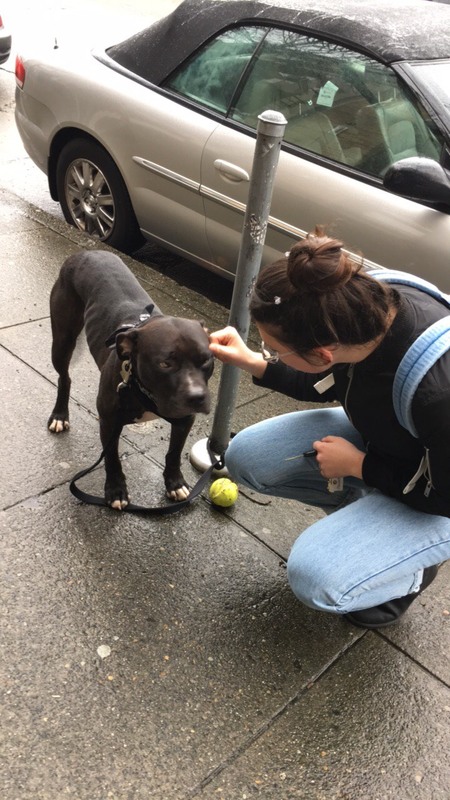 Dogs were an extremely important aspect of this trip, btw. 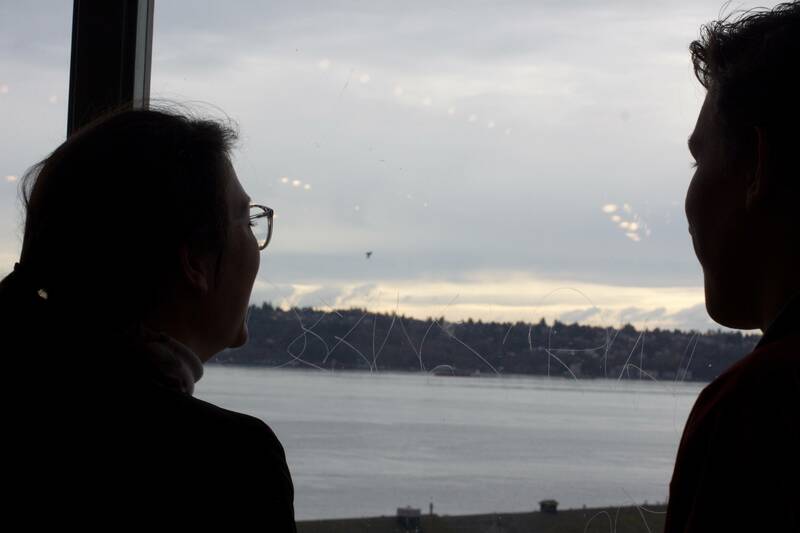 I spent my last day going to Bainbridge Island (where my friend is a nanny for a few kids), and on the ferry ride there (and back), I realized that this ride was a crucial part of many kids' childhoods. Overlap occurred when I looked back onto those ferry rides to Bald Head Island, an East coast beach town that filled my summers and winters as a child. 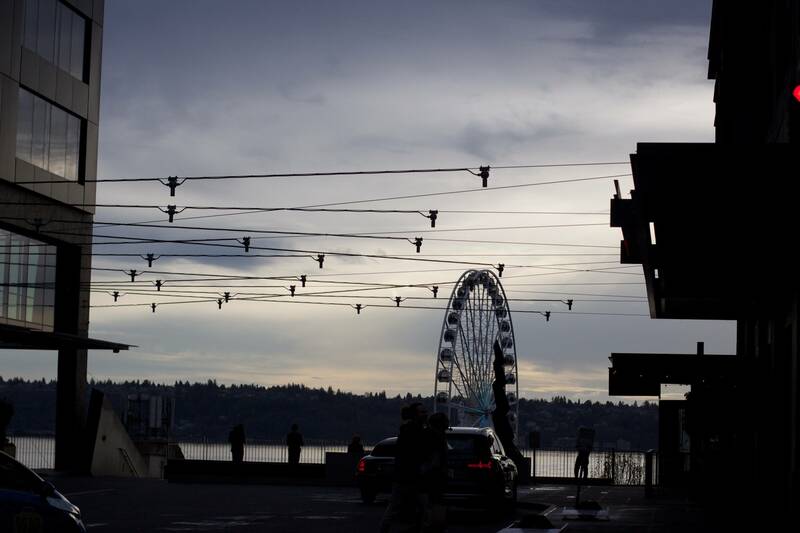 Maybe Seattle isn't so different than my neck of the woods after all. Photos of me shot by Julia, all other photos shot by me. Like, an upside-down mullet, perhaps? Velvet dress (wearing as a top) and neck scarf (wearing as a bracelet) by Urban Outfitters. Pants and mesh shirt (similar here) by Zara. Loafer mules by Madewell. Shall we start with the business portion first? It's not as exciting as the top half, and saving that for last will be way more fun (and the party always comes last, right?). As for the bottom half, I grabbed my cropped trousers from Zara that I could definitely wear on many occasions, including a) a job interview b) Sunday brunch c) my shift at Madewell and d) leaving my room at 3 pm on a Sunday to finally start studying for midterms (they're so comfy!!). I continued the ~business lewk~ by slipping on my newest pair of loafer slides--a method to look both professional and easy at the same time. They've been glued to my feet for the past two weeks, kind of like how the summer version of these shoes were glued to me last summer. Ironically, because slides are the last type of soles that would be impossible to take off (get it? they literally slide off!). Really bad fashion jokes aside, this half of the outfit was a bit too 9-5 for me. So commence the party! When I think of clothes fit for a party, I obviously think bright colors (think red, cobalt blue, emerald green) and glitter. Maybe heels, too? But if party is looked at in a more subtle, nonchalant manner, it can also mean lush fabrics. Velvet, obviously. Fur (of the faux type, of course). Silk. What about other interesting fabrics that don't necessarily fit into this category? 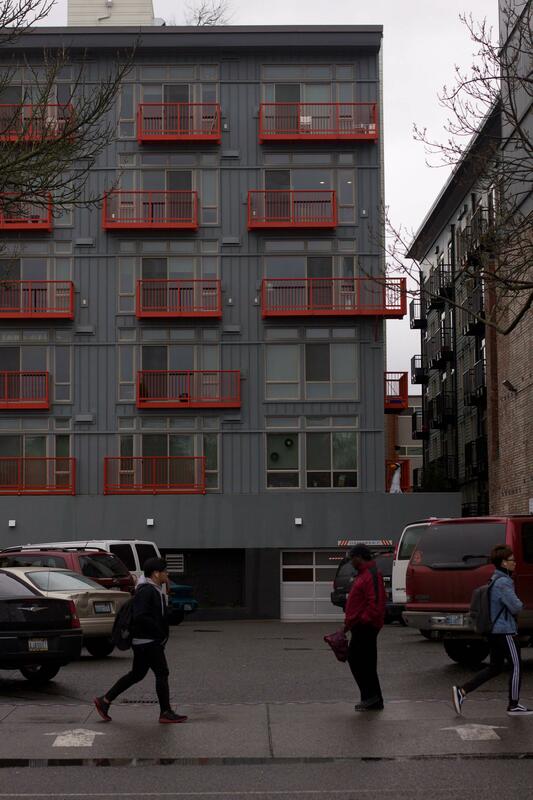 Like mesh, for example. Not exactly "lush," but definitely party-worthy. So I combined the two! Well, velvet and mesh, that is. 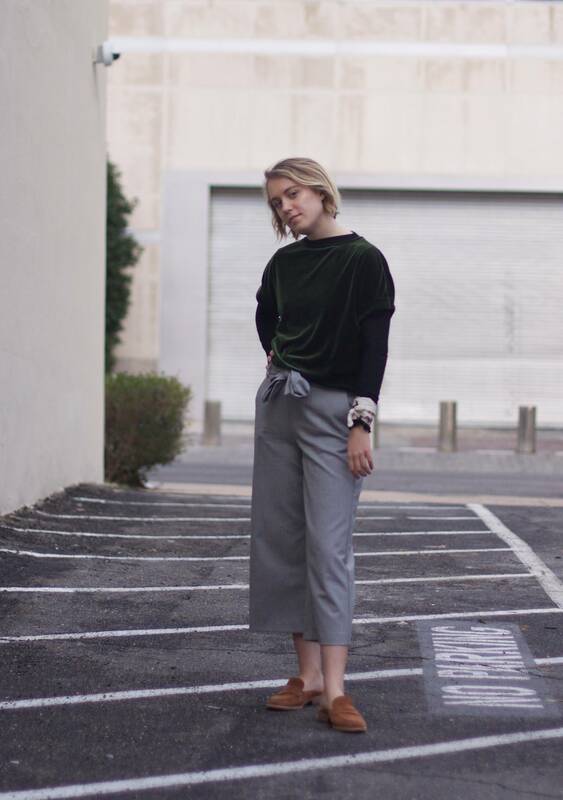 Layer a mesh, long sleeve top (which, by the way, is such an investment! It can be layered under practically anything on a warm(er) day, and can be worn on its own over a pretty (or not!) bra if you're really ~feeling yourself~) under a boatneck velvet dress that I'm wearing as a shirt for two reasons: the dress with pants look only works on few occasions, and this dress was a bit too short to wear sans trousers. To continue the party, I tied a floral neck scarf around my mesh clad wrist, because using clothing pieces for alternative uses that they weren't actually made for is so much fun! And rebellious. Just like a party. Some may say these are just clashing styles, others might point out that it's a day-to-night look taken two steps too far. But clashing should be good; that's what fashion's all about--breaking barriers and leaving the :o emoji on people's face. Also, I could easily go dancing after a day of work in this. Maybe if I at least changed the shoes to heels? Photos from Vogue.com, collage made by me. My Gucci review is here! 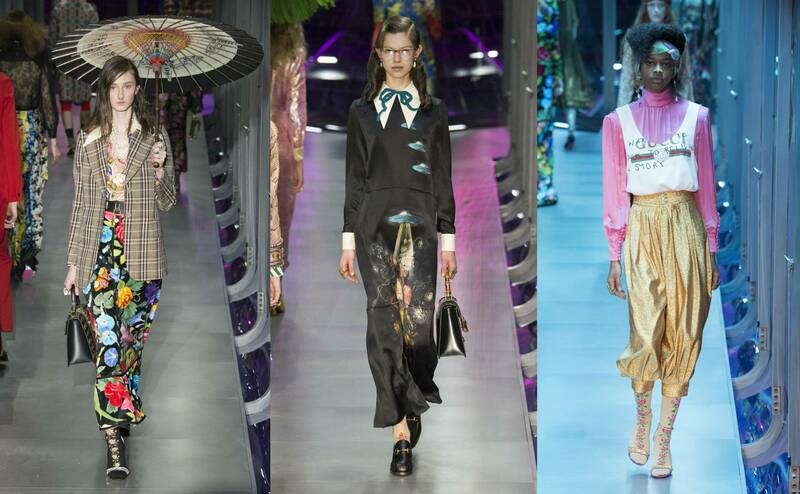 Unlike how I do my other fashion week reviews, where I select four to seven (ish) shows from each week to review, Milan Fashion Week is a bit different—I'm always only interested in reviewing Gucci. 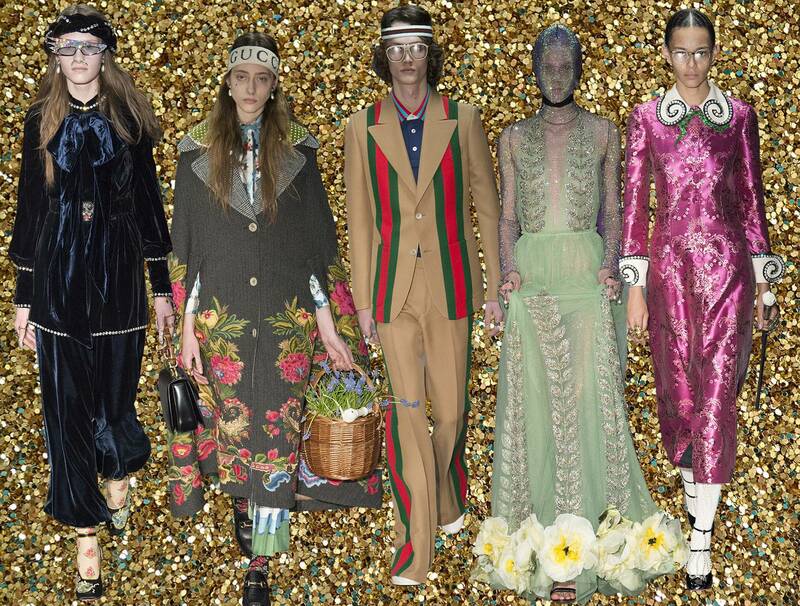 This favoritism started when I did my first ever show review master post, where I selected a few shows from each week in September of 2015 (SS16, if you were curious), but I only chose to review Gucci for the MFW section. Ever since, they've been the only ones who have actually caught my eye during this week. Alessandro Michele is just that talented!!! While it has remained my favorite fashion house since, well, September of 2015, they just keep getting better! It started with more then became more is more and now we're at more is more is more, or you could argue, because Michele has been designing for them for five seasons now, that more is more is more is more is more this season. Does that make sense? Alessandro Michele won't stop his maximalist attitude with clothes—with each passing collection, he adds more accessories, more prints, more jewelry, more oomph, more wow factor. And he does it so artistically! It's kind of like that challenge where you have to put on all of your clothes at once, but minus the awkward marshmallow vibe that results from 20 sweaters layered together at the same time. 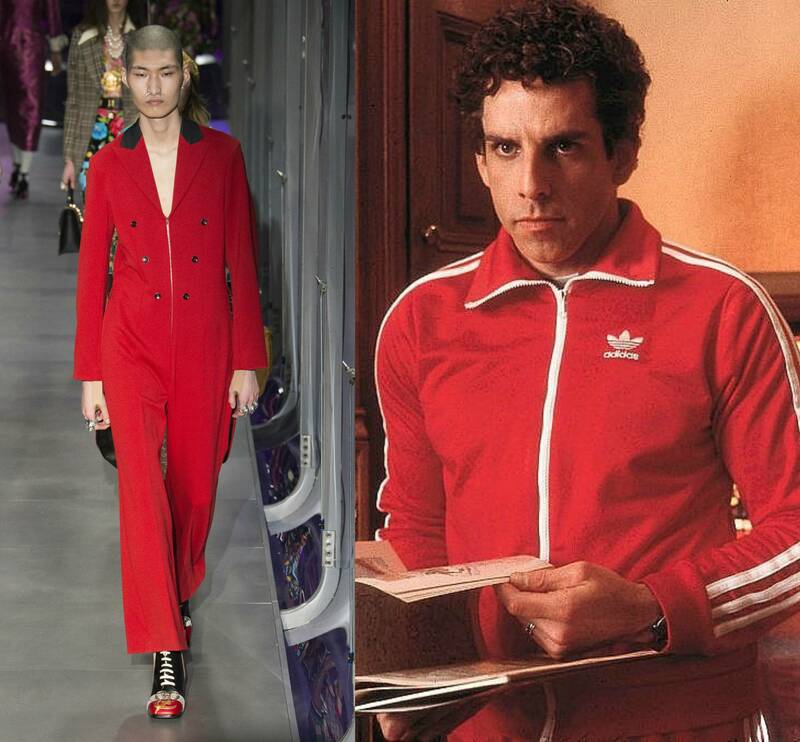 No khakis or tie were included, but if you replace those pants with velvet pantaloons and that tie with a jewel-encrusted collar and long pussybow, the Gucci'd version of Max Fischer from Rushmore comes to life. May be a bit of a stretch, but that lion emblem on the model's belt definitely matches up with the Rushmore crest on Max's blazer. Even the glasses match! And we all know that Fischer would be one to wear floral socks with pumps (fight gender norms!). Also, doesn't that braided-headband thing (??) sort of resemble Max's coonskin cap? 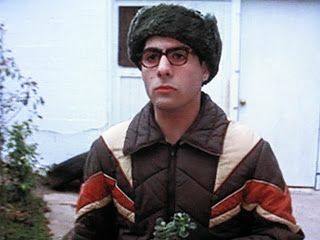 Richie Tenebaum has always been one of my favorite characters in the Wes Anderson world—I blame it on my secret love for Luke Wilson and his really cool outfit. 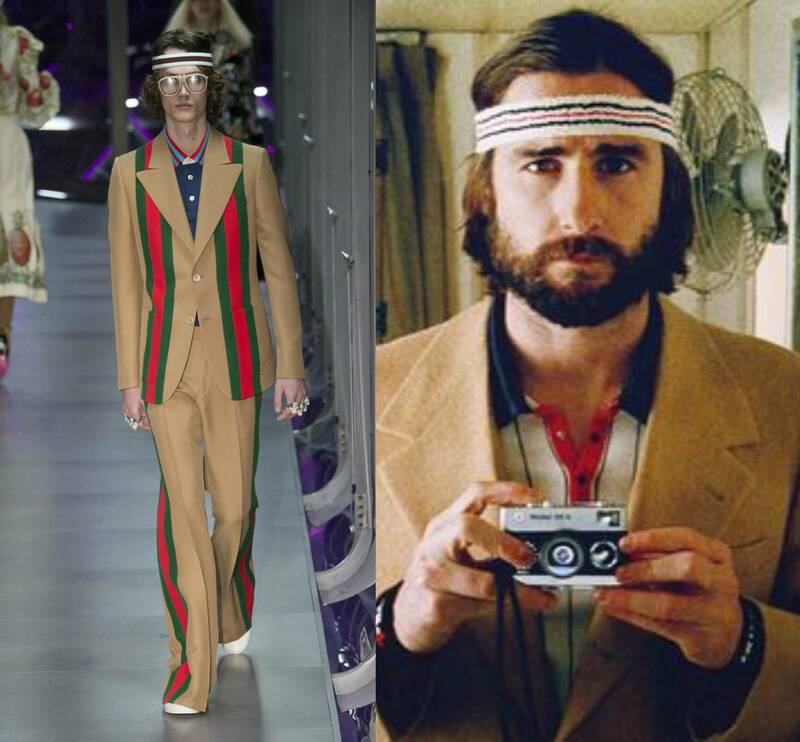 That '70s-esque camel suit and striped sweat band create a look that only The Royal Tenenbaums fans would immediately recognize, but now Gucci fans will, too, with an almost exact replica of the look, except now Gucci's version has the traditional Gucci Stripe™ embellishing the bland suit and grandpa glasses (these are very in) to replace Richie's full beard. The Gucci model is even wearing sneakers, as if he were ready to play tennis just like Richie! It's like Alessandro literally had to ask Wes to borrow these inspirations; that's how exact the match is. And that leads me to two important questions: a) is this considered stealing or just drawing from inspiration? And b) which came first: the Gucci Stripe™, or the stripes seen on Richie's sweat band? 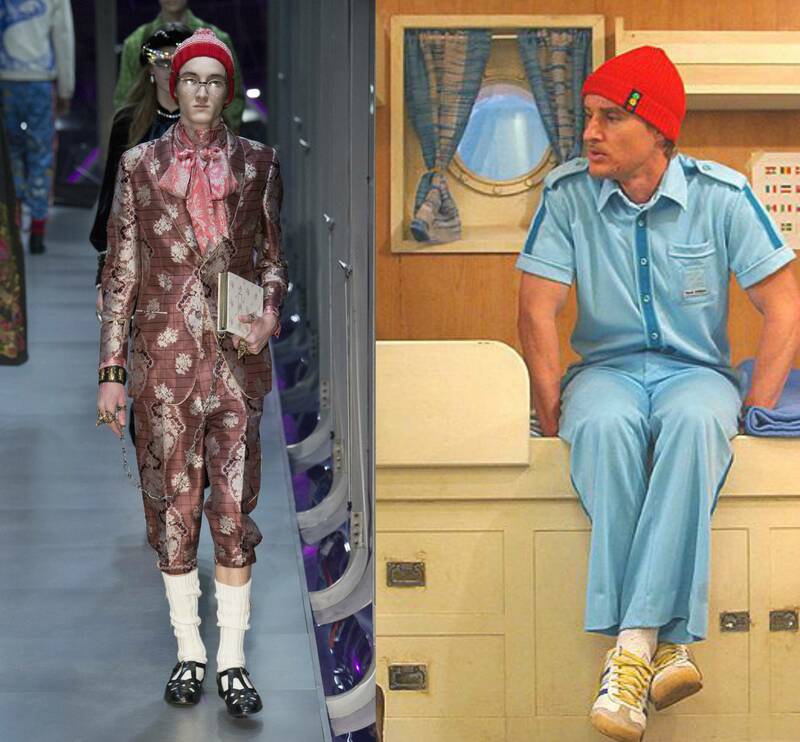 Although this is a stretch, how could I pass up on the infamous Life Aquatic with Steve Zissou red hat, even if the rest of the Gucci outfit doesn't resemble the crew's outfits? 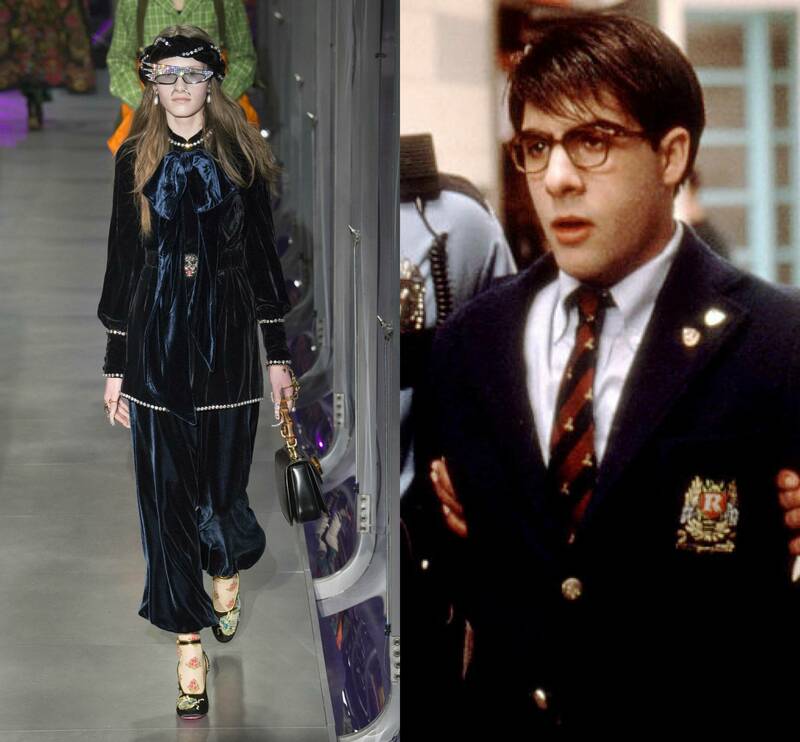 There are some similarities, though—the uniformity of the Gucci jacquard suit is seen in the monochrome blue crew uniform. Replace the Adidas sneakers with half-shin socks and Renaissance style shoes, and now Ned Plimpton works for Gucci instead of his father. 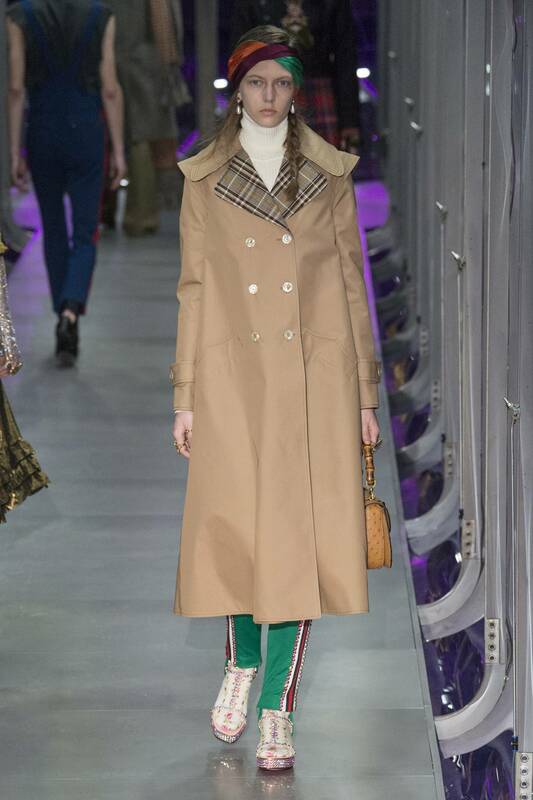 Some food for thought: how cool would this Gucci girl look with a Darjeeling-esque suitcase? 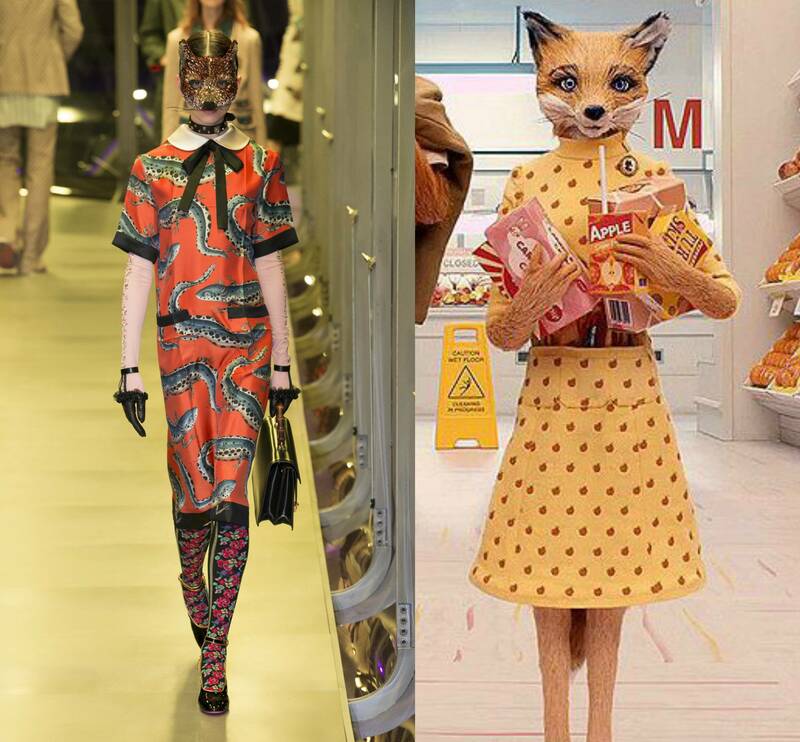 Mrs. Fox from Fantastic Mr. Fox was definitely seen on the Gucci runway—this Gucci girl is literally wearing a fox mask, something we haven't seen in fashion, well, ever. Also, Mrs. Fox always had #outfitgoals, and Gucci is just emphasizing that with those super cool sheer floral sleeves (tights for your arms?) and pussybow sateen dress featuring some sort of aquatic creature. The connection between the fox and the aquatic creature? Unknown. 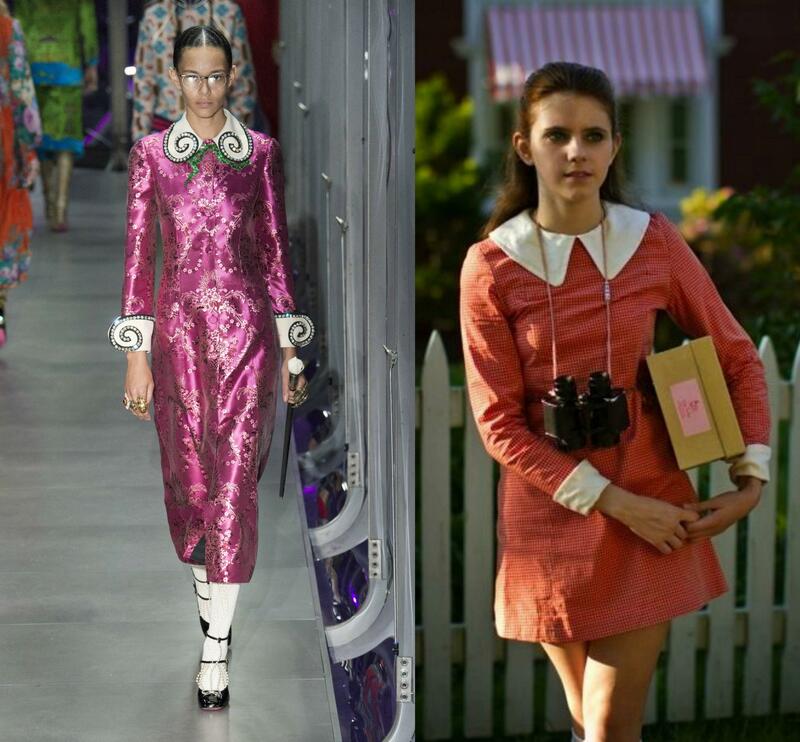 Suzy from Moonrise Kingdom grew up! This seems to be one of the more popular Wes Anderson-themed halloween costumes, next to Margot Tennenbaum, and Gucci finally transformed this costume into reality, switching soft gingham to brocade and embellishing her classic white collar and cuffs with jeweled black swirls. White socks remain a constant, but replace the saddle shoes with grown up heels (Stoker, anyone?) and those binoculars with that peculiar wand-looking-object that makes our most favorite coming-of-age character, well, not in her coming-of-age phase anymore. Very bittersweet. 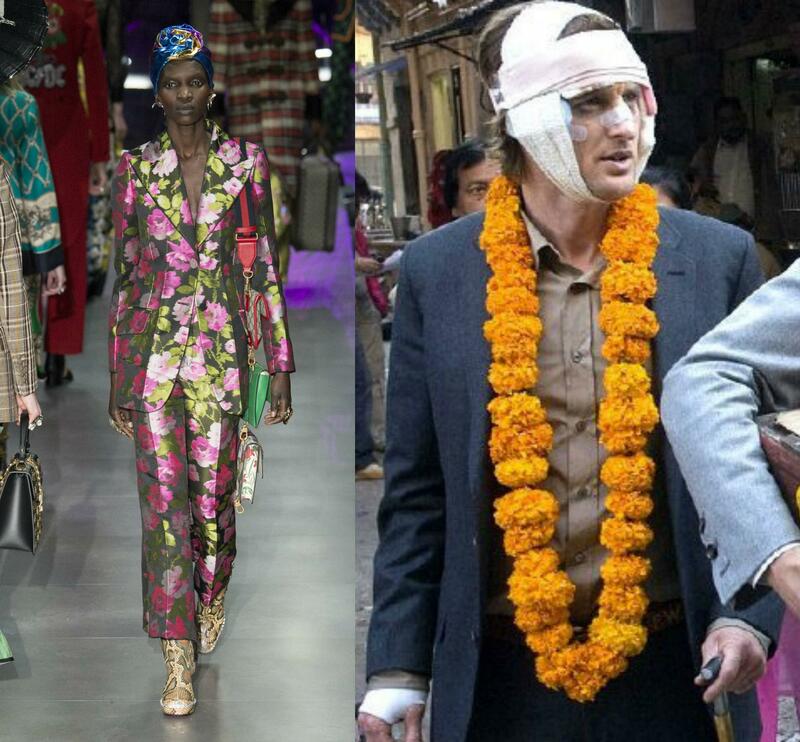 No Gucci looks directly represented any characters from Grand Budapest Hotel, the most recent Anderson film, but some represented the scenery that seems to be even more important than those character's #ootds. That model on the left, wearing a pastel pink coat encrusted with jewels and black swirls matches the impossible-to-miss color scheme of the hotel; the model in the middle represents (you guessed it!) the snow on the trees. Too much of a reach? I still bet Wes Anderson would approve. 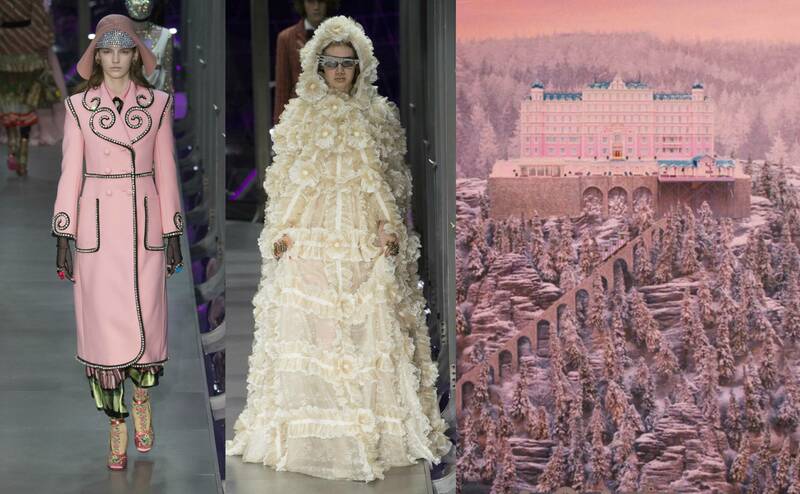 Grown-up Agatha (Saoirse Ronan's character) would definitely wear the pink coat during the winter months in Budapest, and maybe even the monstrous white gown at a ball. Vogue called Michele an alchemist due to his ability to transform an ordinary girl into a Gucci Girl™, but I also want to call him a Renaissance man (pun intended) due to his ability to practically achieve everything—his collections are far more than fashion collections, they're displays of art, of beauty, of craft. And possibly direct displays of Wes Anderson's films. Now that's talent.